1) The age-friendly plan was analized and approved by the County Council, with the support of Oportunidad Mayor Foundation and Old People County Union. 2) A technical coordination group was appointed, with participation of County officers, Civil Society Organizations, universities and local Government delegates. 3) The age-friendly project was informed to old people and community through assemblies, working meetings and workshops. 4) Old people and community focal groups were summoned in order to develop a local diagnostic and the assessment of the changes they expect to be implemented. 5) Quality and quantity data was recollected about present initiatives and projects about old people, to contribute to the initial diagnostic. 6) During year 2017 activities focalized on old people were increased -as part of the age-friendly plan (e.g. : sports, culture, arts)- and they will continue next years. 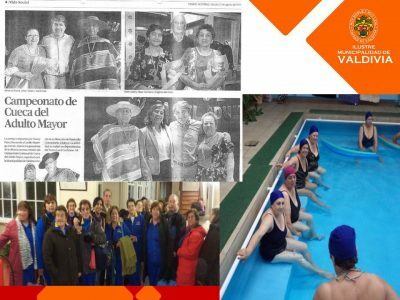 7) To answer the needs detected to became an age-friendly city, County and Government Departments, as well as Civil Society Organizations and private sector, are working together in order to develop a gerontologic pole in Valdivia. 9) A Media campaign is being developed in order to invite all community and old people into the project. Meanwhile an official launch of the project is being prepared by the County and Old People Organizations, with the support of Oportunidad Mayor Foundation. 10) A scholarships program for geriatric specialization is being implemented in order to have geriatric medical attention into Valdivia.